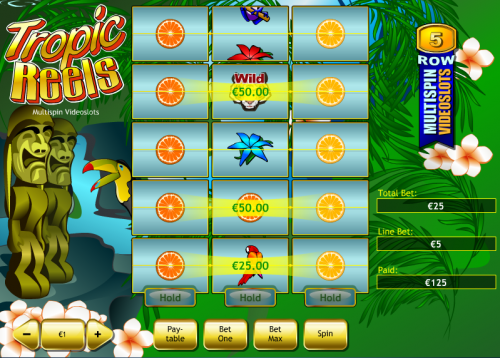 It’s back to basics for this review for a look at Playtech’s simple online slot, Tropic Reels; it’s easy to regard games such as this as less entertaining than the five reel slots with multiple bonus games but a significant number of people still enjoy these three reel machines online and offline. The backdrop to Tropic Reels is jungle greenery accompanied by Easter Island-like statues and tropical animals while the soundtrack as you would expect is jungle noises with special sounds when you land a winning combination. The symbols are all tropical-themed and we have pineapples, tropical plants, purple, green and red toads, various flavours of oranges, colourful parrots and a tiger which represents the wild symbol. While Tropic Reels is certainly a simpler slot there’s an feature which lifts it above some other games. This is a five row, multispin machine and when the game first starts you will notice that there are five paylines on the screen in front of you. When you first press the spin button only the bottom payline is active but once that has landed you are then given the chance to hold any or all of the reels. Those symbols will then be held on all the other paylines and this of course gives you a total of five chances to land profitable combos. The multispin/hold is the game’s main feature and to make the most of it you need to know which combinations of symbols are the ones which payout; there’s no point in holding a symbol in the wrong place and fortunately there’s a big ‘pay table’ button at the bottom of the screen so you can check it frequently. To help you out the game will automatically hold the more obvious symbols. Tropic Reels is not a game you can dive into and just keep pressing the ‘spin’ button because you won’t get anywhere; it takes some time to learn which symbols should be held and when but it’s worth sticking with if you like three reels slots.